Our classroom pond is up and running! As part of our current IB unit, we are learning about how people, animals, and plants interact with each other. We wanted to show the children this using something they can easily see in Indiana, so we chose to learn about how the people, plants, and animals around and in a pond can interact with each other. We are lucky to have a pond on our school grounds, but we wanted to also have a pond that the children helped to create. We collected rocks from our playground and cleaned them off really well. We then placed them along with 6 gallons of spring water into a big plastic tub we got at the Container Store. We also added some aquatic plants and a few koi fish (along with 20 comets that are no longer living). We also have a submersible pump that is circulating the water and keeping things semi-clean. We would like to include some more plants and animals that are more native to this area–does anyone have any ideas? Here is a picture of a new Math Work Station I introduced this week. In the past we played this game with 5 chips and I noticed that we were getting bored with 5 so I increased the game to 10. 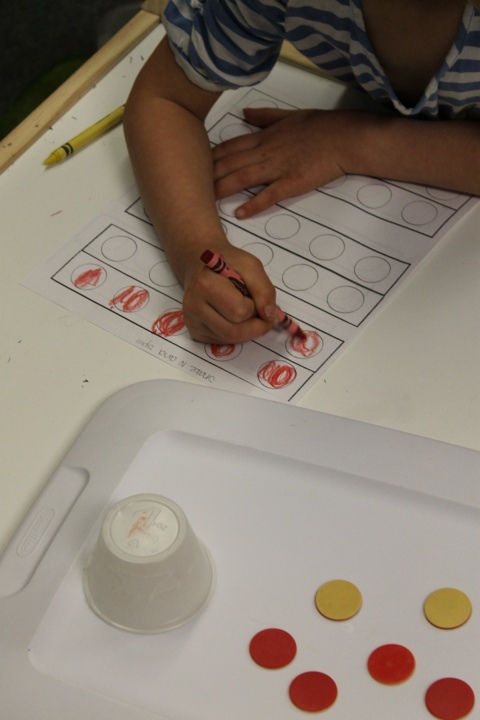 The children shake ten chips in a cup and record how many are red and how many a yellow. 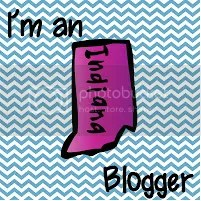 I shared in a post last week, how to access the basic scope and sequence we are using in Indiana. I created a document back in June last year that I carry with me everywhere to help me wrap my head around what I’m supposed to teach when. When I created this document, we (I) had just attended some PD provided by our Math Coaches and had been given several new resources to help with the implementation of the Common Core standards for Math. These resources are in addition to our adopted text of Math Their Way. I’m going to share this with you below because it’s been working for me. I know this is the order of the standards in Indiana, but I do not know if other states have chosen to follow the same order (it seems logical that they would considering how these standards build on each other–but nothing is ever logical!). On the left side you will see the standards and on the right, activities that I found out of the resources we were given (they are listed on the last page of the document) that helped me to teach these standards. I hope you find this helpful and can at least adapt this to your states. all you have to do is ask! I was running out of new ideas to put in my Magnet Work Station area and I told my kiddos this one day. I told them I saw they were getting bored with what was there and I didn’t have any ideas as to what I could put there next. They said, “We have an idea!”. We are learning about community helpers so how about something to do with community helpers. We would like pictures of community helpers with speech bubbles so that we can match them with each other. I never would have come up with that and it has provided a much needed new activity and keeps them busy. 🙂 They are reading the words on the speech bubbles and are having so much fun matching them up with the community helpers. I found some community helper clip art on the internet (through a google search) and printed them out and laminated them. I then used the speech bubble clip art in Word and made enough for each helper. I then laminated them and wrote “I am a _(insert community helper name here)___”. I stuck magnets on the back of them and we started having fun! I’ve just finished reading Kathy Richardson’s new book (I wrote about it in my last post) and I have to say I love it! When I look at the current Common Core standards for Math, the idea of making my K students master addition and subtraction facts to five floors me! It is not a developmentally appropriate practice for 5 and 6 year old children to memorize math facts unless they have a definite handle on the number concepts and what Kathy calls the “critical learning phases”. Throughout the chapters, Kathy discusses the process that children go through to develop number concepts and what the critical phases are that must be learned before the next critical phase can happen. She shares that although we can make children memorize facts, it is completely useless to their future math development because children need to work through the critical learning phases on their own. 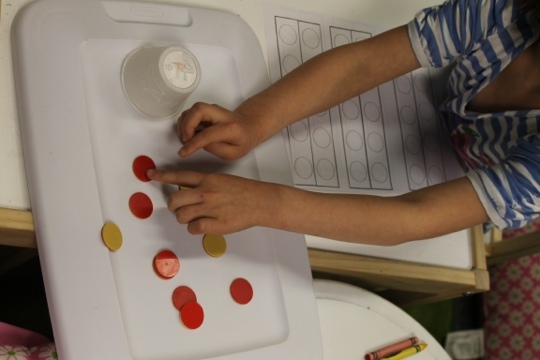 If they cannot understand that 3 is three and 4 is four and demonstrate their understanding in several ways, then children will not be able to apply that to math operations later on. Kathy makes it clear that children must go through these phases and that children can not be forced into them, some children will understand them more quickly than others and progress through them more quickly than others, but we cannot as teachers force their understanding along. This would be a great book for a PLC or book study to help understand how children learn and develop number concepts! This is how I choose names so that everyone gets a chance to find something in our Morning Messages (and whenever else they are needed). 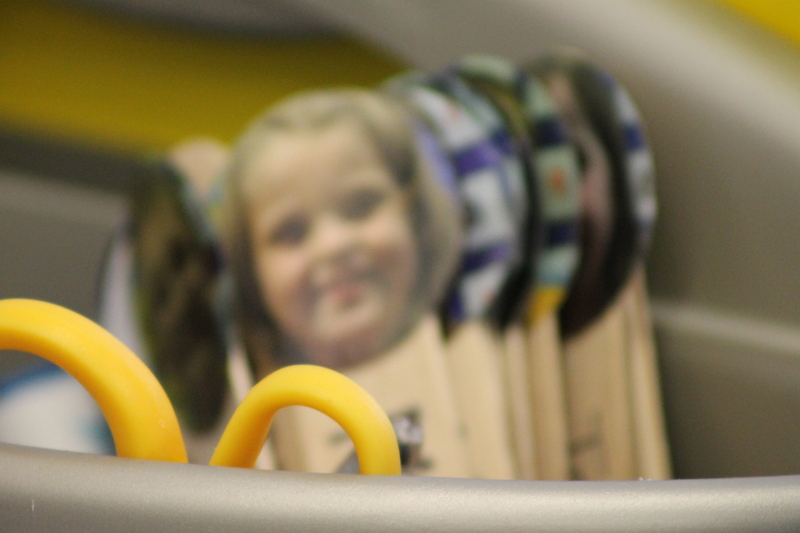 I take each child’s picture on the 1st day of school, laminate it, and then punch them out with one of my Stampin’ Up! circle punches. I tape them on to jumbo popsicle sticks from Discount School Supply and write the child’s name sideways with a permanent marker. At this time in the year, I choose one child each day to be the stick-picker. They get to call out the child’s name who will come to the board next. This is great for even my non-readers because they can identify everyone just by their picture. I keep them in a plastic cup next to my bench. Here is an experiment that we did a few weeks ago using one of the National Geographic science kits (we adopted the Earth, Physical, and Life science kits last year). 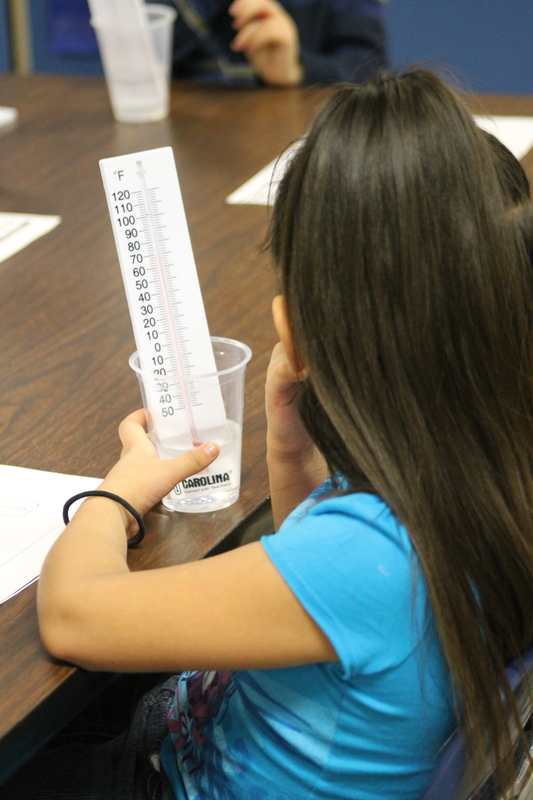 We took the temperature of cold water and warm water and explored the thermometer; how to read it and how to record the temperature on a recording sheet. We also talked about how the cold temperature was related to colder days and the warm water temperature was related to warmer days.